The landscape of Northern Norway with its mountain peaks, idyllic fishing villages and protected bays is a delight to explore at anytime of year. During the summer months, this is the land of the midnight sun – when the sun does not set below the horizon. This 7-night itinerary provides the freedom to explore the Lofoten archipelago, named by National Geographic as one of the most unspoiled island destinations in the world and a historic and geological masterpiece. Continuing north by Hurtigruten cruise boat, the itinerary takes in Tromsø and offers the opportunity to visit the city’s fascinating museums, brewery and Arctic Cathedral. Overnight at the Anker Brygge, The Lofoten Islands. Transfer to Tromso airport for your return flight to UK. Anker Brygge is located on Austvagoya, the largest of the Lofoten islands where spectacular mountains frame a wild coastline. 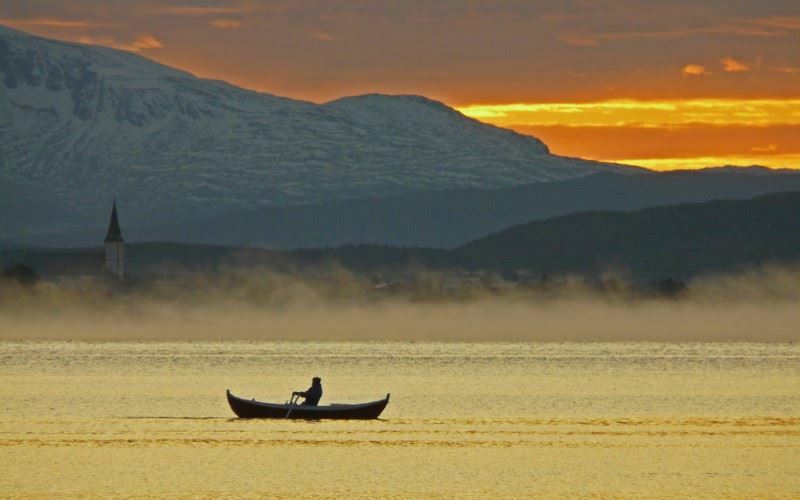 The Clarion Collection Hotel With is conveniently located in the historic Skansen area of Tromsø and within easy walking distance of the Polar museum (Polarmuseet), Polaria (an arctic themed visitor centre) and Arctic Cathedral 'Tromsdalen'. The Clarion Collection Hotel With is conveniently located in the historic centre of Tromsø and within easy walking distance of the Polar museum (Polarmuseet), Polaria (an arctic themed visitor centre) and Arctic Cathedral ‘Tromsdalen’. This stylish hotel offers comfortable rooms with light decor and modern furnishings. Various artefacts around the hotel tell the story of the Troms County Steamship Company in its heyday – early 1900’s, which gives the hotel a nautical feel. Guests can take scenic day trips to the nearby islands or indulge in a little fishing or bird watching. An intimate hotel where personalised service and attention to detail is apparent throughout. Recommended. Family rooms, located on the 6th floor and accessible by steps from the 5th floor, have twin beds and a designated living area with double sofa bed (suitable for 1 adult or 2 children). Parking payable locally c.200NOK per day. Winter activities available. For more information click here.